ALL REQUIRED INFORMATION TO FACILITATE A SUCCESSFUL 187 AND/OR 489 VISA APPLICATION IS AVAILABLE ON THIS WEBSITE. TO ASSIST US TO EXPEDITE OUR PROCESSING TIMES, PLEASE READ THIS INFORMATION CAREFULLY BEFORE CONTACTING US WITH AN ENQUIRY, AS MANY ENQUIRIES ARE COVERED BY THE INFORMATION BELOW. NO REFUNDS ARE AVAILABLE UNDER ANY CIRCUMSTANCES. RSMS allows Australian employers in regional and low population growth areas of Australia to address skilled vacancies in their business that they have been unable to fill locally by sponsoring skilled foreign workers for permanent residence. RSMS covers all of Australia except Brisbane, the Gold Coast, Newcastle, Sydney, Wollongong and Melbourne. RDA FSC as the RCB can only process Direct Entry Stream RSMS visas. Direct Entry Stream is for applicants who are untested in the Australian labour market and have not held a subclass 457 visa for at least the last 2 years or who are applying directly from outside of Australia. RSMS Direct Entry stream nominations to the Department of Home Affairs (DHA formerly DIBP) must be accompanied by advice from an RCB, however, the advice may be provided before or after lodgement to DHA. The Department cannot approve a nomination where advice from an RCB has not been provided. Please note, it is the responsibility of the applicant to ensure applications are submitted under the correct Stream and have noted the correct ANZSCO code. For more information regarding RSMS visas click HERE. DIBP Form 1404 and RCB RSMS Coversheet must accompany every ‘Request for Assessment’. You must submit the Essential Documentation (as noted in the Essential Documentation Checklist below) with attachments clearly labelled as per the checklist. You must ensure that ALL Essential Documentation is submitted with your application and labelled as per the Essential Documentation Checklist (below). Once your application has been submitted and you have received your acknowledgement e-mail, you are unable to add any further documentation. No refunds are given under any circumstances. 3. The terms and conditions of employment applicable to the position will be no less favourable than the terms and conditions that are provided to, or would be provided to, an Australian citizen or permanent resident performing equivalent work in the person’s workplace at the same location. – Every assessment of occupation made will be verified against Australia and New Zealand Standard Classification of Occupation (ANZSCO). Each nominee will require a skill level within ANZSCO skill levels 1 to 3. – The nominator will have to provide evidence that the position is full-time (at least 35 hours per week) and ongoing for at least two years. – The nominee must be less than 45 years of age when visa is lodged. All the documents in the following checklist are essential and MUST be provided to satisfy the assessment requirements. Please do not include detailed financials or documentation that is not required as per the Checklist. Please ensure that you label each document/attachment as per the Essential Documentation Checklist. The ‘Request for Assessment’ application may be paper-based or in electronic form. Nominators who intend to lodge or have lodged RSMS nominations under the Direct Entry Stream for this region will need to comply with this RCB’s specific requirements regarding making ‘Requests for Assessment’. 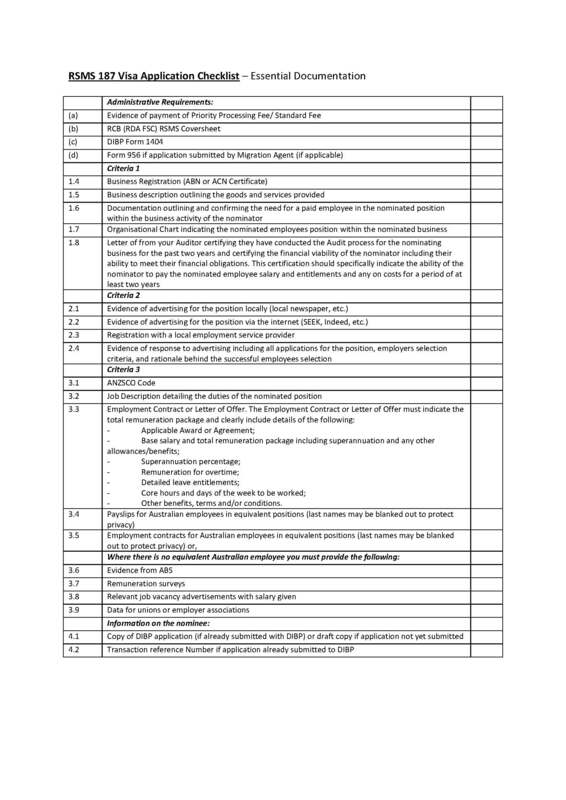 Full details of specific requirements can be found in the Essential Documentation Checklist below. After receiving the application RDA FSC will assess the nomination according to the criteria outlined above and in the Essential Documentation Checklist (see below) and provide a ‘statement of advice’ to DHA as to whether the Minister should be satisfied that the nomination meets the criteria. During assessment RDA FSC will not ask for additional evidence or supporting documentation. The application will be assessed as submitted. RDA FSC will provide detailed advice to DHA and inform the agent/applicant as to whether or not RDA FSC has assessed your application as meeting the criteria. The agent/applicant will NOT receive details regarding reasons behind an assessment outcome. Note: All fees are non-transferable and non-refundable. Standard processing fee: $605 including GST. Processing time: Maximum of three (3) months from receipt of both the application and full payment. Priority processing fee: $935 including GST. Processing time: Maximum of four (4) weeks from receipt of both the application and full payment. Processing of applications will not begin until the processing fee is paid and the application is received. Include the EFT receipt with your application. The EFT receipt must show the deposit date as well as the reference noted above. Please note this RCB conducts its assessment by utilising the documents requested in the Essential Documentation Checklist above and by utilising our specialist knowledge of the region. By applying, you accept all the Terms and Conditions required by this RCB. Employers should note, they are not compelled to provide the documents requested, though it is in their interests to do so. Failure to provide all documentation in the above list may result in a NOT RECOMMENDED result. If this occurs no fees or any portion thereof will be transferred or refunded. Please note that RDA FSC expects applicants or their agents to demonstrate their suitability via a complete and accurate application as per the requirements noted on this website. Inaccurate and/or incomplete applications will not be be approved and, as noted elsewhere, no refunds are given under any circumstances.You must ensure that ALL Essential Documentation is submitted with your application and labelled as per the Essential Documentation Checklist (above). Once your application has been submitted and you have received your acknowledgement e-mail, you are unable to add any further documentation. What if my nomination does not meet the requirements? If RDA FSC assesses the application as not meeting the criteria we will inform you, however details will be provided at the Assessment Panel’s discretion and no correspondence will be entered into. There is no requirement for RDA FSC to provide any feedback or reasons behind an unsuccessful outcome to agents/applicants. The DHA will reach its own decision based on our advice and the applicant will have the opportunity to provide the DHA with additional documentation and have the ‘right to review’ through the DHA. RDA FSC will not enter into any discussion regarding unsuccessful applications. RDA Far South Coast is currently assessing applications. Please do not call the office to check the status of your application, you will receive an email from us in due course. PLEASE NOTE: the overload of email requests asking for processing updates has caused a significant backlog to our processing times, therefore, RDA Far South Coast WILL NOT respond to telephone or email requests for updates on processing times. As noted, processing may take up to THREE MONTHS. Contacting us within the allotted processing period may result in your application being further delayed. Your Information: Please note, by law we are required to hold your information for a period of seven (7) years. Once RDA FSC has processed your application, your file is archived at a secure location. RDA FSC will not share your information with anyone. Should you, as the nominating business owner, require any information from your file, you must provide your request in writing with proof of identity. A processing fee of $250.00 is payable to access information that has been archived. For both the 187 and 489 Visas, please note that RDA FSC requires applicants to demonstrate their suitability via a complete and accurate application as per the requirements noted on this website. Inaccurate and/or incomplete applications will be assessed as unsuccessful. This RCB takes matters of identification seriously. Any anomaly or inconsistency in identification will result in an unsuccessful outcome. We are unable to seek clarification or request missing documentation – applications are assessed as submitted. You must ensure that ALL Essential Documentation is submitted with your application. Once your application has been submitted and you have received your acknowledgement e-mail, you are unable to add any further documentation. No refunds are given under any circumstances. RDA FSC considers a range of other information when assessing each application including, but not limited to, the applicants previous employment experience, ranking in relation to other applicants, demonstrated character and employment opportunities currently available in the region. Please note that the RDA FSC Assessment Panel considers each application in light of these criteria. With regard to the requirement for Certified Copies: PLEASE NOTE: Electronic documents are able to be certified under certain conditions according to the most recent Justice of the Peace Handbook (page 37). RDA FSC does not accept digital certificates. According to RDA FSC, colour copies are not classified as certified. If your documents are not in English, you will need to provide official translations.